It’s not hard to be cynical about remasters. The game industry seems obsessed right now with re-releasing games from just a few years ago with slightly improved resolutions and little else. But fighting the good fight are the LucasArts updates. The most recent, Full Throttle Remastered, takes a beloved 1995 classic, gives is a shiny new lick of paint, cleans up every aging element, and makes it run flawlessly on modern machines. It’s exactly what a remaster should be. The trend of exceptional LucasArts remasters started back with The Secret of Monkey Island: Special Edition in 2009, and with the first two games in the pirate comedy series given such great treatment, it seems only fitting that the next project be the third game (and last of the great SCUMM adventures): The Curse of Monkey Island. It has recently been re-released on Steam and GOG after an agonising wait, but purely in its original form. Surely it is the prime candidate for remaster work? 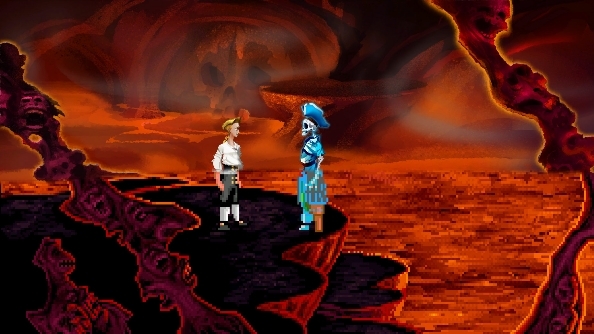 The Curse of Monkey Island is 20 years old (I’ll give you a moment to have an ageing crisis). But unlike its older siblings and Day of the Tentacle, it wasn’t rendered in old-school pixel graphics. 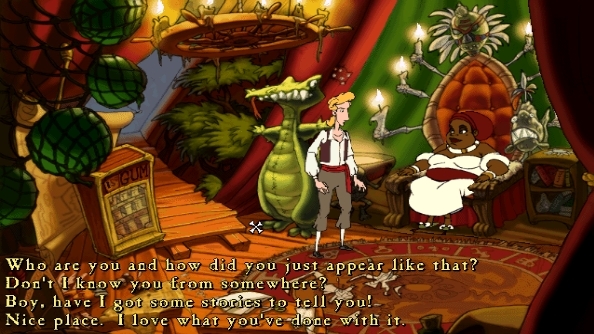 The SCUMM system was pushed to its limits, with Monkey Island’s characters and colourful Caribbean world hand-painted and animated with a distinctly Disney-like approach. It’s a style that, in my head, has never aged a day, and not in need of a remaster. But it’s been over a decade since I last played, so surely that’s nostalgia? Surely. Well, erm, no, actually. The Curse of Monkey Island really does look that good. See for yourself in the screenshots that decorate this article. That’s not to say it hasn’t aged. The game needs to be played in ScummVM because it screams at 64-bit operating systems like a crazed gibbon. It’s all designed to be played on 4:3 ratio monitors, so the image is either squashed a bit or sandwiched between two verticle black bars. The edges of characters look a bit rough, and they’re all animated at about four frames per second, making the action fairly choppy. But boy, is this a good-looking game. And so here comes the call for a remaster. The LucasArts efforts so far certainly add a level of modern shine to these games, with beautifully smooth scrolling scenes and added animation in the backdrops that help increase the atmosphere and sense of life. 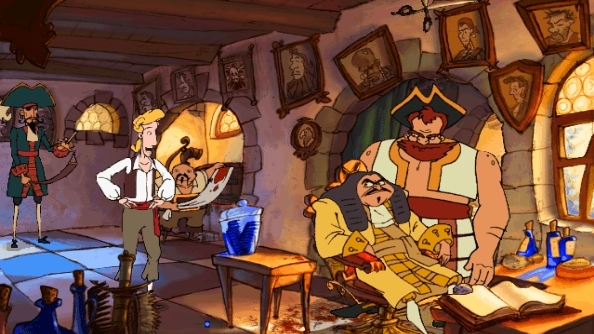 Monkey Island 3 requires comparatively less work: the backdrops just need up-scaling to HD resolutions (provided the original artwork still exists), although characters would potentially need re-drawing in order to animate at much higher frame rates. Perhaps the addition of some dynamic lighting to make that Caribbean sun feel even warmer. 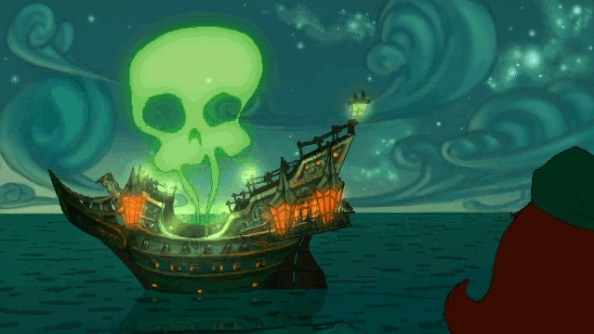 But it’s hardly the overhaul that LeChuck’s Revenge required. Curse’s art style would, admittedly, negate the need for the LucasArts remasters strongest feature though: the instant switch between old and new. A time-machine is bound to your ‘F10’ key, each tap bouncing you between the ‘90s and modern day. It’s arguably the element that emphasises the worth of a remaster the most. Rather than relying on your hazy, rose-filtered childhood memories, these remasters push the old visuals in front of your nose, as if shouting “See how far we’ve come! Look at all the work we did for you!”. Frequently the effect is subtle in order to preserve the feel and style of the original, but there’s no denying the work that goes into modernising those classic people and places. For the first two Monkey Islands the remaster magic is in the audio, too: switching from old to new washes out the MIDI tracks and replaces them with a beautiful, upbeat orchestral score. Characters who used to communicate with the open-and-shut movement of a pixel mouth and some colour-coded subtitles now converse with full voice-over. 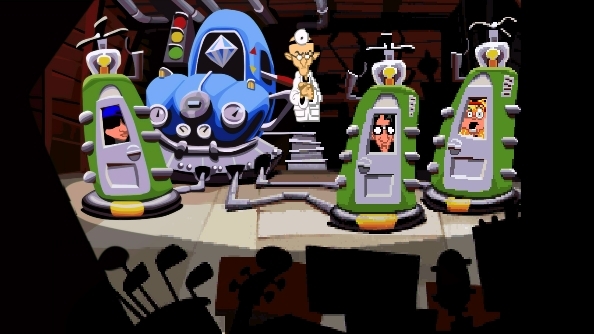 The Day of the Tentacle remaster goes one further: you can mix and match graphics and sound to keep the old-school charm of pixel art, but enjoy new music and voice work sans-crackle and hiss. Basically, remasters are a real treat for your eyes and ears. For a Curse of Monkey Island remaster, audio would be one of the lesser concerns: it still sounds incredible today. The dialogue is surprisingly lacking the crackle and dullness associated with old-school recording and compression, and the orchestral score remains superb with all its steel-drum glory. No doubt a remaster would sharpen it up, but as far as updates are concerned, Curse is all about animation and frame rates. When it comes to LucasArts though, a remaster isn’t just an attempt at making games look and sound like they were made sometime within the current decade. They’re celebrations of the process of making games and the people behind them. That’s why the majority of them have developer commentary tracks, with the original creators explaining the work that went into designing certain moments, puzzles, and characters. 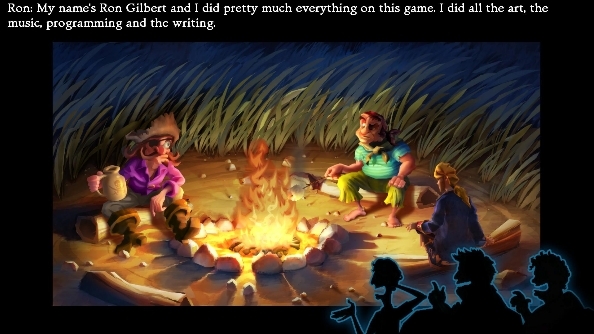 Tim Schafer, Ron Gilbert, and Dave Grossman have been mainstays on these, having been kings of adventure in the genre’s heydey. For those tired of Schafer’s voice though (and he is around a lot these days), Curse of Monkey Island has the potential to offer something new. The third game in the series saw a mostly different development team take command of the deck, headed up by Full Throttle’s Jonathan Ackley and Larry Ahern. The latter featured in Full Throttle Remastered’s commentary last year, so hopefully he would be up for the challenge of explaining Curse’s divisive final act. Not only that, but Curse’s puzzle design is among the best ever conceived, and would make for truly fascinating discussion. This is especially true of ‘Mega Monkey’ mode: the increased difficulty setting that added more complexity to almost every puzzle in the game. Adventure games don’t typically go for difficulty settings, and it’s just one of many aspects of Curse of Monkey Island that would be lovely to listen to the designers chat about. Above all the technical elements though, the appetite for a Curse of Monkey Island remaster is down to it being an easy-to-love, highly memorable adventure that was a key part of many a player’s childhood. A remaster, as Day of the Tentacle proved once more earlier this year, allows us to re-experience that joy and revisit a moment in time when things were perhaps a little more comfortable. Not only that, but – like The Godfather remastered in 4K – they’re proof that, in an industry that moves so quickly, there are the odd gems that endure forever. 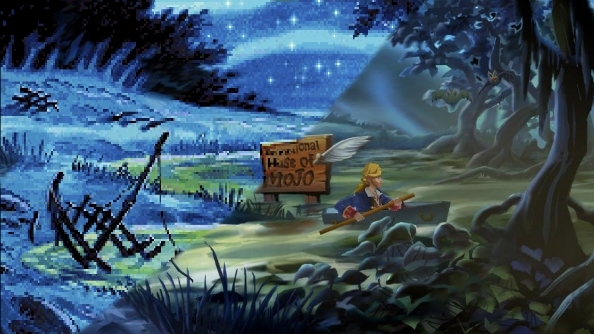 Curse of Monkey Island is certainly one of those games, and I think it certainly deserves a little update magic beyond a re-release on Steam and GOG. If not, well, I’m certainly not throwing away the double CD set from my childhood any day soon.